CPAG's annual research conducted by Donald Hirsch, Director for the Centre for Research on Social Policy, on the cost of bringing up a child found that parents both in and out of work are struggling to meet the minimum family costs. The Cost of a Child 2015 finds the minimum cost of a child from birth to age 18 remains high at £149,805 (a 1.6% increase on 2014 and a 5% increase since 2012). The report concludes that the outlook appears to be for the high cost of a child to rise less steeply in future years but that state support in covering these costs to deteriorate sharply as a result of government policies, creating a net loss for most low income families. 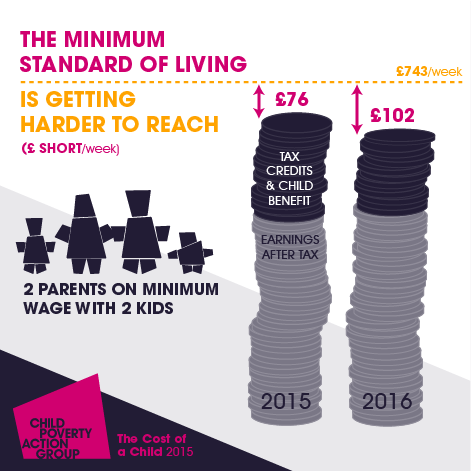 Couple-families where each parent works full-time at the current minimum wage are 16% short of the basic amount needed to provide themselves with what the public regards as a minimum standard of living, the report finds. For a couple with two children, that’s a gap of £75.75 per week. The report shows a wider gap for out-of-work couple families – at 43%. For lone parents, the shortfall is 13% for those in work– 39% for those not working.